IDF 2011 Intel labs has created a prototype processor that achieves a high level of energy efficiency by running at voltages barely above those those required to light up its transistors. Intel's marketing folks trumpet that the processor, code-named Claremont, can be "run off a solar cell the size of a postage stamp", but at CTO Justin Rattner's keynote at the Intel Developers Forum on Thursday, it was clear that they meant a commemorative stamp, not a standard-issue Liberty Bell. 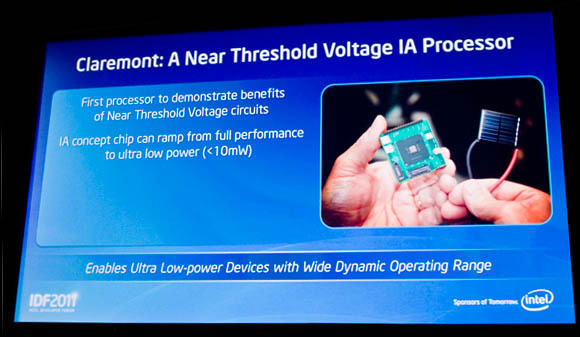 Marketing spin aside, the "near-threshold voltage" chip is quite an achievement. Intel first revealed in March 2010 that it had a prototype chip running at such low voltages, but Claremont's creators took that technology and baked it into a full IA architecture processor. 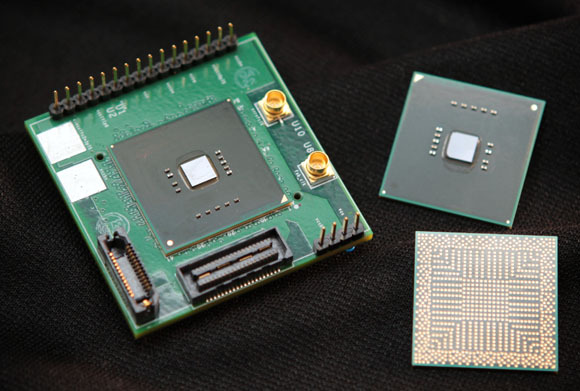 Based on a Pentium core, Claremont can not only be throttled down to "within a couple of hundred millivolts of the threshold voltage of the transistors," said Intel engineer Sriram Vangal, who demoed the chip during Rattner's turn, but – equally important – it also has a high dynamic range that allows it to be cranked up to deliver ten times the low-power performance by increasing the voltage. 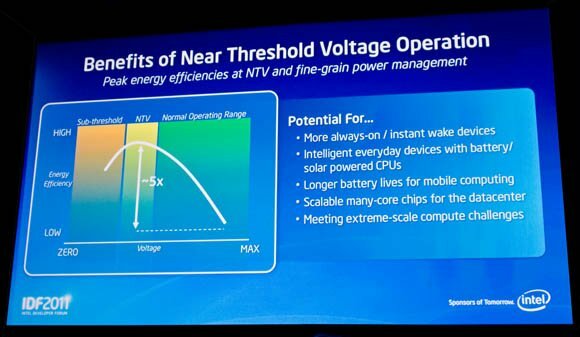 In a post on the Research@Intel blog, Vangal details some of the challenges involved in cranking power down so close to the threshold voltage. "To put it simply," he writes, "the difference between a '1' and a '0' in terms of electrical signal levels become very small, so a variety of noise sources can cause logic levels to be misread, leading to functional failures." Vangal and his Intel Labs team took the Pentium core design and used it as the basis for Claremont. "We redesigned the on-die caches and logic and incorporated new circuit design techniques and methods to tolerate variations at [near-threshold voltages]," writes Vangal. During Rattner's keynote, the goals of Intel's system-wide low-voltage program were explained by Shekhar Borkar, director of Intel's research on future microprocessor technologies, and the principle investigator of Intel's DARPA-funded ubiquitous-computing project. "Let's take an example of a hundred-gigaFLOPS system today," he said. "If you want that performance, it will require about 200 watts of power. With [Intel's] extreme-scale technology, we would like the same level of compute performance requiring two watts or less in a handheld – a hundred gigaflops in your hand." In today's chips, transistors are operated at several times their threshold voltage. By redesigning a processor to be tolerant to near-threshold voltages, Borkar said, "What the theory tells us is that it will increase the energy efficiency by about 8X or so." Claremont's efficiency improvement was more at the 5X level. "You might be wondering," Borkar said, "'Why only 5X? ', because I said 8X earlier. The reason is that we use an old core here. If we had started this design from scratch, we could have got an 8X or 10X improvement." Using the old Pentium core caused other challenges. When Vargal was building the two systems he demoed – one running Linux and one running Windows – he had a hard time finding motherboards old enough to support the Pentium. He and his fellow chip boffins were "literally dumpster-diving, trying to find old boards that would work," he said. Rattner responded, chuckling, "So here we are, on the frontiers of computing, and we're looking in the dumpsters for motherboards.